Made of high grade synthetic polymer having long durability.Mounted on sturdy wooden frame for easy display.Size : 40x80 cm Well illustrated informative Beautiful painted in bright colors Model is accurately made from actual specimen references,photographs and encyclopediar e f e r e n c e u n d e r e x p e r tguidance. 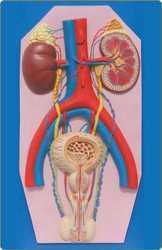 The Model shows the structures of retroperition alcavity, pelvis withbones and muscles, inferior venacava, aorta with its branches,upper urinary tract, kidney with adrenal gland, ureter, bladder, etc.Dissectible into 4 parts. having long durability.Mounted on sturdy wooden frame for easy display.Size : 40x80 cm Well illustrated and informative Beautiful painted in bright colors Model is accurately made from actual specimen references, photographs and encyclopedia reference under expert guidance.Model is a great teaching tool for anatomy lessons. 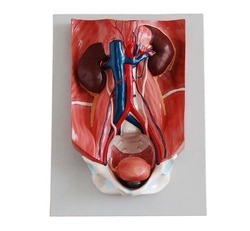 Made of high grade synthetic polymer having long durability.Mounted on strudy wooden framefor easy display.Size : 40x80 cm Well illustrated and informative Beautiful painted in bright colors Model is accurately made from actual specimen references,photographs and encyclopedia reference under expert guidance.Model is a great teaching tool foranatomy lessons. Made of high grade synthetic polymer having long durability.Mounted on sturdy wooden frame for easy display.Size : 40x80 cmWell illustrated and informative Beautiful painted in bright colors Model is accurately made from actual specimen references,photographs and encyclopedia reference under expert guidance.Model is a great teaching tool for anatomy lessons.